As you know I am an Action Pack fan and this year Kathreen has changed it up a bit. 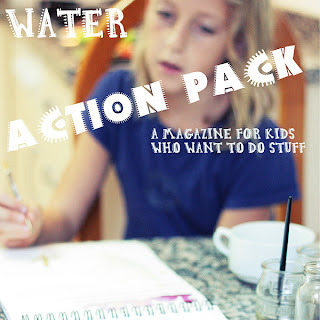 She is currently taking a year and travelling/camping around Australia with her family and still managing to pull together the Action pack magazine. This time round she is doing 4 bigger bumper magazines spaced over the year, the first one this year being Water AND, I am a contributor - whoo-hoo. There are lots of great experiments & activities to get stuck into, the age range is 7-12 but I think younger kids can enjoy many of the experiments even if they don't understand the science behind it yet or you can work together on an activity rather than letting the child do it independently, like an older child would do. Of course, it is all beautifully and clearly laid out and this edition includes activities from making a water rocket to surface tension to water crackers to density towers, plus puzzles and quizzes and there are some great contributors to boot. 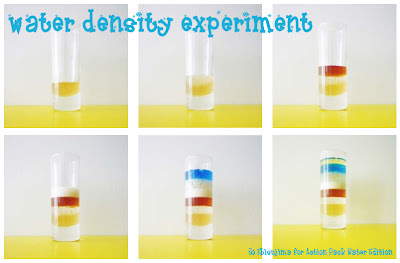 We explored density towers which was as much fun for me as it was ebi-kun and we followed it up with some of his own experiments, that is one of the things I love about kitchen science, follow up experiments can easily be done without any worry of setting of some kind of dangerous chemical reaction (chemistry was not a strong subject for me at school)! Click HERE to buy your copy now - it is an instant download, there is also a freebie included on that page and/or pop your name in the box below to win a copy. Just enter your name and email address to win, the winner will be chosen by random generator at 9am JST March 7th.